Dakota Star Quilt bedding by VHC Brands | P.C. Fallon Co. The Dakota Star Queen Quilt Set includes one queen quilt, one queen Burlap Natural Fringed bedskirt, and two standard shams. The queen quilt measures 90" x 90". The bedskirt measures 60" x 80" with a 16" drop. Each standard sham measures 21" x 27". The Dakota Star collection is black and khaki, featuring a traditional 8 point star in the center, surrounded by a feathered star quilted pattern. The star is made of checks and solids and is bordered in a black and khaki plaid with khaki binding trim. On the back of the quilt is a solid khaki fabric. The quilt has a 100% cotton shell and fill and is hand quilted with stitch in the ditch and echo quilting. This item is imported. Please note, colors may appear differently in different resolutions and on different computers. Machine wash, gentle cycle. From The Ashton & Willow Line made by VHC Brands. The Dakota Star Luxury King Quilt Set includes one luxury king sized quilt, one king Burlap Natural Fringed bedskirt, and two king shams. The luxury king quilt measures 105"L x 120"W. The bedskirt measures 78" x 80" with a 16" drop. The king shams each measure 21" x 37". The Dakota Star collection is black and khaki, featuring a traditional 8 point star in the center, surrounded by a feathered star quilted pattern. The star is made of checks and solids and is bordered in a black and khaki plaid with khaki binding trim. On the back of the quilt is a solid khaki fabric. The quilt has a 100% cotton shell and fill and is hand quilted with stitch in the ditch and echo quilting. This item is imported. Please note, colors may appear differently in different resolutions and on different computers. Machine wash, gentle cycle. From The Ashton & Willow Line made by VHC Brands. 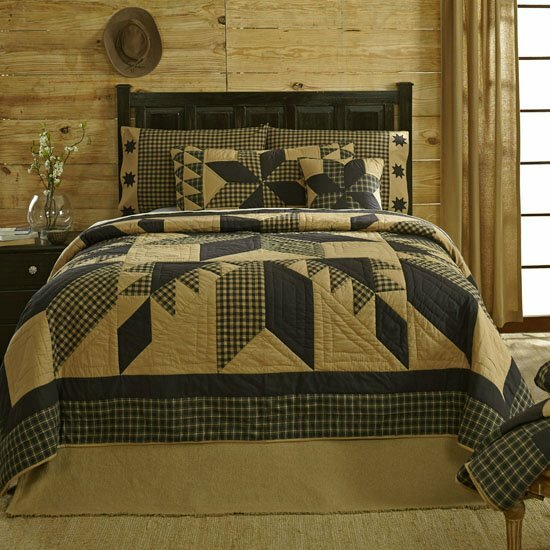 The Dakota Star Twin Quilt measures 86"L x 68"W. The Dakota Star collection is black and khaki, featuring a traditional 8 point star in the center, surrounded by a feathered star quilted pattern. The star is made of checks and solids and is bordered in a black and khaki plaid with khaki binding trim. On the back of the quilt is a solid khaki fabric. The quilt has a 100% cotton shell and fill and is hand quilted with stitch in the ditch and echo quilting. This item is imported. Please note, colors may appear differently in different resolutions and on different computers. Machine wash, gentle cycle. From The Ashton & Willow Line made by VHC Brands. Manufacturer's UPC code is 840528108938. The Dakota Star Queen Quilt measures 90" x 90". The Dakota Star collection is black and khaki, featuring a traditional 8 point star in the center, surrounded by a feathered star quilted pattern. The star is made of checks and solids and is bordered in a black and khaki plaid with khaki binding trim. On the back of the quilt is a solid khaki fabric. The quilt has a 100% cotton shell and fill and is hand quilted with stitch in the ditch and echo quilting. This item is imported. Please note, colors may appear differently in different resolutions and on different computers. Machine wash, gentle cycle. From The Ashton & Willow Line made by VHC Brands. Manufacturer's UPC code is 840528108808. The Dakota Star King Quilt measures 105"L x 120"W. The Dakota Star collection is black and khaki, featuring a traditional 8 point star in the center, surrounded by a feathered star quilted pattern. The star is made of checks and solids and is bordered in a black and khaki plaid with khaki binding trim. On the back of the quilt is a solid khaki fabric. The quilt has a 100% cotton shell and fill and is hand quilted with stitch in the ditch and echo quilting. This item is imported. Please note, colors may appear differently in different resolutions and on different computers. Machine wash, gentle cycle. From The Ashton & Willow Line made by VHC Brands. Manufacturer's UPC code is 840528108716. The Burlap Natural King Sham is made of soft cotton burlap material for a touch of rustic charm in your decor. Sham features a lightweight poly lining to keep it from distorting shape and your pillow from showing through the open weave. Turned edge seam. 21" x 37". Reverse is same soft cotton burlap with a 3" overlap secured with three buttons. Pillow fabric is 100% cotton. This item is imported. Please note, colors may appear differently in different resolutions and on different computers. From The Victorian Heart Collection made by VHC Brands. Manufacturer's UPC code is 840528103117. The Dakota Star King Sham measures 21" x 37". The Dakota Star collection is black and khaki, featuring a traditional 8 point star in the center. The star is made of checks and solids and is accented at each end in black and khaki plaid triangles. Plaid binding trim. On the back of the sham is a solid khaki fabric and a 3-tie closure and a 3" overlap. This item is imported. Please note, colors may appear differently in different resolutions and on different computers. From The Ashton & Willow Line made by VHC Brands. Manufacturer's UPC code is 840528109065. The Burlap Natural ruffled euro sham measures 26" x 26" and is 100% cotton. This sham is woven into a soft "burlap" fabric that has a natural look and feel. The sham includes a 1/2" ruffle and the ruffle has an additional 1/2" of fringe. The back includes a three-button closure with a 3" overlap to conceal the pillow insert. The pillow filler is sold separately. (Photographed with filler.) This item is imported. Please note, colors may appear differently in different resolutions and on different computers. From The Victorian Heart Collection made by VHC Brands. Manufacturer's UPC code is 840528103124. The Solid Black queen bedskirt measures 60"W x 80"L with a 16" drop. Ruffle ratio is 1.2 times the deck length on three sides, gathered. The front skirt panel overlaps the side panel 2.5" at the front corners. This item is imported. Please note, colors may appear differently in different resolutions and on different computers. From The Victorian Heart Collection made by VHC Brands. Manufacturer's UPC code is 840528101731. The Burlap Natural Ruffled Twin bedskirt has a soft cotton burlap gathered ruffle finished with split corners to fit any bed frame. Hemmed at edges. White woven deck. Measures 39"W x 76"L with a 16" drop. Machine wash in cold water, gentle cycle. Do not tumble dry. This item is imported. Please note, colors may appear differently in different resolutions and on different computers. Made by VHC Brands. Manufacturer's UPC code is 840528143083 . The Solid Black king bedskirt measures 80"L x 78"W with a 16" drop. Ruffle ratio is 1.2 times the deck length on three sides, gathered. The front skirt panel overlaps the side panel 2.5" at the front corners. This item is imported. Please note, colors may appear differently in different resolutions and on different computers. From The Victorian Heart Collection made by VHC Brands. Manufacturer's UPC code is 840528101717. The Burlap Natural Fringed twin bedskirt is 100% soft cotton burlap and measures 39"W x 76"L with a 16" drop. The deck is a tan cotton the same color as the ruffle. This tailored skirt features a fringed hem to add a bit of character and texture to any bedding ensemble. Front skirt panel overlaps side panel 2.5" at the front corners. This item is imported. Please note, colors may appear differently in different resolutions and on different computers. From The Victorian Heart Collection made by VHC Brands. Manufacturer's UPC code is 841985034143. The Burlap Natural Ruffled Queen bedskirt has a soft cotton burlap gathered ruffle finished with split corners to fit any bed frame. Hemmed at edges. White woven deck. Measures 60"L x 80"W with a 16" drop. Machine wash in cold water, gentle cycle. Do not tumble dry. This item is imported. Please note, colors may appear differently in different resolutions and on different computers. Made by VHC Brands. Manufacturer's UPC code is 840528143076. The Burlap Natural Ruffled King bedskirt has a soft cotton burlap gathered ruffle finished with split corners to fit any bed frame. Hemmed at edges. White woven deck. Measures 78"L x 80"W with a 16" drop. Machine wash in cold water, gentle cycle. Do not tumble dry. This item is imported. Please note, colors may appear differently in different resolutions and on different computers. Made by VHC Brands. Manufacturer's UPC code is 840528143069. The Burlap Natural Fringed Pillow is made of soft cotton burlap material for a touch of rustic charm in your decor. Pillow cover features a lightweight poly lining to keep the pillow from distorting shape and the pillow insert from showing through the open weave. Trimmed with .5" ruffled fringe. 16" x 16". Reverse is same soft cotton burlap. The pillow insert is concealed by a 3" overlap secured with two buttons. Pillow fabric is 100% cotton. Pillow fill is 100% polyester. This item is imported. Please note, colors may appear differently in different resolutions and on different computers. From The Victorian Heart Collection made by VHC Brands. Manufacturer's UPC code is 840528153761. The Dakota Star Quilted Pillow is black and tan, featuring a traditional 8 point star in the center. The star is plaid and solid on a tan background and has plaid binding trim. Stitch in the ditch and echo hand quilting. Machine pieced. On the back of the pillow is a solid tan fabric and a 3" overlap with 2-ties to conceal pillow insert. 16" x 16". Pillow fabric is 100% cotton with 100% cotton batting. Pillow fill is 100% polyester. This item is imported. Please note, colors may appear differently in different resolutions and on different computers. From The Ashton & Willow Line made by VHC Brands. Manufacturer's UPC code is 840528152986. These Burlap Natural pillow cases are 100% cotton and measure 21" x 30". These cases are made with cotton fabric woven into "burlap" for a soft, natural look and feel. Pillow cases are sold as a set of two. This item is imported. Please note, colors may appear differently in different resolutions and on different computers. From The Victorian Heart Collection made by VHC Brands. Manufacturer's UPC code is 840528103094.